Thanks to the Reformed Broker and Financial Armageddon, we have some new readers. For those of you who are new, we take the weekend off. All of us here at the Bonddad Blog have day jobs, so we like to spend some time with the family. 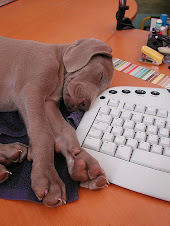 All of us will be back on Monday, bright and early. We hope you continue to find our blog informative and data centric. At the end of the day, it's really all about jobs and income. The big news this week was that the economy added 151,000 jobs during October. Also, both August and September were revised up significantly. The two sectors that were set back a year because of stimulus expiration, construction and state/local workers, showed a gain of 5,000 and a loss of 7,000 respectively - which is as good as could have been hoped for. Income in October actually went down 0.1%, but increasingly confident consumers spent 0.2% more than the previous month. Auto sales went up over 5% from the previous month, and about 15% from last October, to a 2 year high at over 12 million vehicles annualized. ISM services, and especially ISM manufacturing showed surprising strength. Monthly sames store sales were only up 1.6%, confirming the weekly reports. The economy appears to have recovered from the shocks of summer. The price of a barrel of Oil, almost certainly reacting to the Fed's quantitative easing program, increased about $5 just in this week to close to $90 a barrel. This is simply not sustainable. If Oil goes over $90 and stays there, we will probably go right back down into a recession in a few months. Gas at the pump remained stable at $2.82 a gallon. Gasoline usage was exactly the same as one year ago, at 9.015. Gasoline stocks are down considerably, to no more than 5% above their normal range for this time of year. Meanwhile the Mortgage Bankers' Association reported that its seasonally adjusted Purchase Index increased 1.4% last week, the second week of increase. Meanwhile, the Refinance Index decreased 6.4% from the previous week. Refinancing is still proceeding at a good clip in response to near record low 15 and 30 year mortgage rates. The ICSC reported same store sales for the week ending October 30 increased 0.1% week over week, and were up only 2.0% YoY, again a very weak comparison with recent months. Shoppertrak reported that sales were up only 1.1% for the week ending October 30 compared with a year ago, thus confirming the slowdown we have seen in the ICSC reports for the last few weeks. The BLS reported 457,000 new claims. The 4 week average is still slightly above 450,000. So after last week, at least this week we went right back into the muck. Railfax continued to show growth compared with last year, but the rate of growth for baseline and intermodal loads declined slightly compared with this time last year. Economically sensitive waste and scrap metal improved is running ever so slightly better than last year's levels. There is trend growth but no higher. The American Staffing Association reported that for the week ending October 26, temporary and contract employment advanced to 101.0. This is good news as a leading indicator for employment in general, but it is still below its all time high of 110. .
M1 increased .9% last week, and was up 0.7% month over month, and up 5.7% YoY, hence “real M1” is up 4.6%. M2 declined .1% last week, but increased +0.6% month over month, and increased 3.3% YoY, so “real M2” is up 2.2%. Weekly BAA commercial bond rates increased 0.04% last week to 5.80%. This compares with yields on 10 year bonds up +.13%. 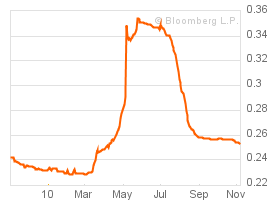 Thus there is no sign of buyers seeing increased default risk in B rated corporate bonds. The final October report of the Daily Treasury Statement showed $131.3 B in receipts vs. $124.7 B a year ago, a gain of about 5.5% (and this year October had one fewer reporting day than 2009). For the last 20 days, receipts are up $134.6 B vs. $124.8 B a year ago, a gain of about 7.8%. Seasonality is beginning to be felt in the early November numbers. With the pointed exception of the price of Oil, economic conditions are looking at least as hopeful as they were last spring -- and the best in over two years. Which may still be somewhat weak tea, but its the best we've got. We will have to watch the effect of Quantitative easing on the price of Oil like hawks, and we have to find a way to put Washington to sleep for two years so they don't #$%^ things up. I was a bit surprised by today's report -- I was thinking it would be in the 50,000 -- 70,000 range, not 151,000. 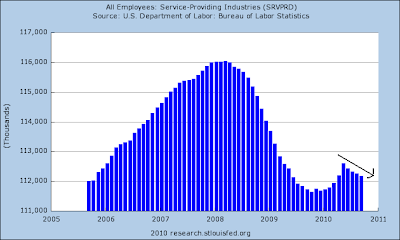 So, the question now becomes, why the job gains now? What changed in October that led to the increase? Notice the three months at the beginning of the year -- March, April and May -- when we saw some nice gains in the jobs market. Then everything just stopped. Why? 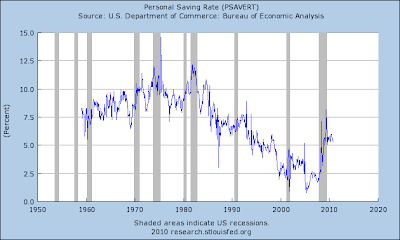 But the abrupt halt in private sector hiring and cliff-diving decline in consumer spending in May defy explanation based just on the above list. A whole host of indicators all pointed to more robust job growth -- ISM manufacturing, temporary help hiring, durable goods orders, real retail sales, and for good measure the Conference Board's (which publishes the LEI) Employment Trends Index. Both one month (the top chart) and three month (the bottom chart) libor spiked in reaction to the crisis, but have since dropped. In addition, we've seen equity markets rally to strong levels, and money flow into the junk bond and investment grade corporate market. In short, maybe the fear is over, leading companies to start hiring again. Before we look at today's report, let's step back and take a longer-term view about the employment situation to see where we are. 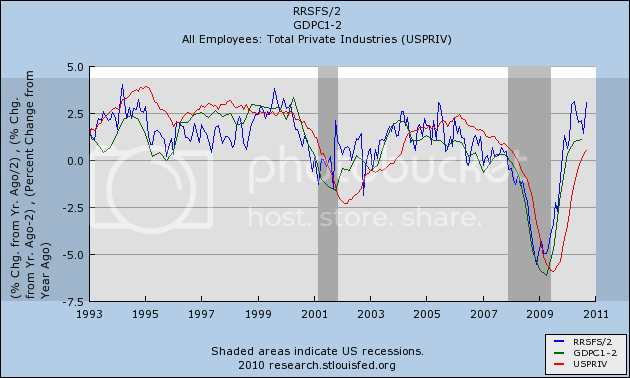 The four employment graphs that follow do not include today's report. Taking a long-term view of initial unemployment claims, notice the 4-week EMA was around 320,000 when the economy was growing. We also see the recession spike followed by the current situation. as the Challenger job cut survey shows, the total job losses have more or less leveled off for the last year. On a seasonally adjusted basis, the jobs picture bottomed right around the beginning of the year. after which we saw a few months of decent gains. 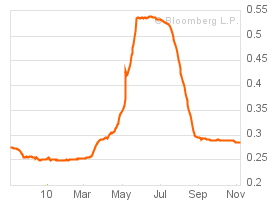 However, starting about 6 months ago that upward surge dried up. The arrow on the chart shows that total jobs started to decline around that time. The rate of decline is small -- that is, we're note seeing a huge jobs crush. However, there is an overall loss occurring. Good producing industries -- which account for 13.83% of all establishment jobs -- have actually adding jobs, although at an incredibly slow pace. Service producing industries - which account for 69% of all jobs -- are the real problem. 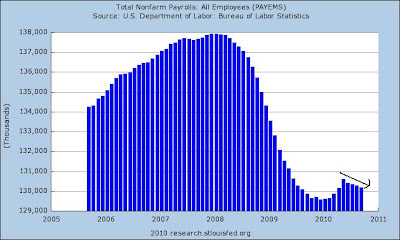 Notice this chart bears a striking resemblance to the total establishment jobs chart. Government employees -- which account for 17% of the workforce -- actually leveled off from mid-2008 onward. 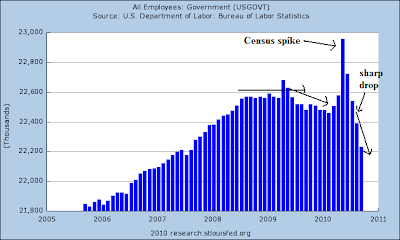 We can also see the big census spike and a big drop in the last two months. 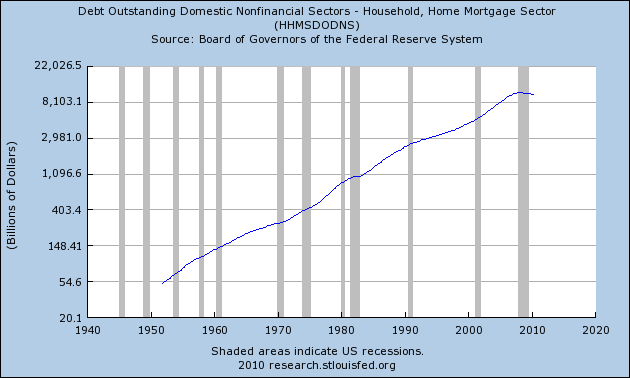 As NDD has noted, this has been caused by the end of the stimulus and its grants to the various states. The above graphs illustrate the primary problem with the economy: even though lay-offs are continuing at above average levels and therefore feeding into the unemployment system, the pace of job losses has been level for about a year. The primary issue is lack of job creation, which more or less stalled about six months ago. Nonfarm payroll employment increased by 151,000 in October, and theunemployment rate was unchanged at 9.6 percent, the U.S. Bureau of Labor Statistics reported today. Since December 2009, nonfarm payroll employment has risen by 874,000. The headline number is very strong -- frankly, much stronger than I expected. The big story here is the increase in private sector jobs -- 154,000. The unemployment rate was unchanged, but we got a nice bump in the establishment jobs report. Short version, this is a good report. On a scale of 1-10, I'd give it a 6.5. I'll be looking at the report in more detail today and over the weekend and will add anything that seems pertinent. The 10 day dollar chart shows the dollar's recent decent. Notice there were there gaps down (a, b and c) followed by two periods of consolidation (d and e). Since breaking the neckline of the head and shoulders pattern, prices have moved decisively lower (a). Notice that as prices have moved lower, they have rallied higher on two occasions, only to find resistance at the EMA (a and b). For the last 10 days, the QQQQs have had a slight upward bias. This is appropriate as the NASDAQ has led the market higher for the last year. Yesterday, the SPYs moved through key resistance areas (a) -- a move that was telegraphed by the QQQQs for the last two days. Yesterday, prices gapped higher at the open (a) and then spent most of the day consolidating gains (b). At the end of trading, prices made one last move higher on higher volume (c). Here are a few thoughts regarding the employment situation, in no order of importance. 1.) Initial unemployment claims have remained stubbornly high for the entire year; they have essentially leveled off in the 450,000-475,000/week range and simply refuse to budge. Job cuts announced by U.S. employers fell in October from a year earlier, signaling that a lack of hiring rather than an increase in firings is restraining the labor market. My guess is there are the following reasons for the lack of hiring. 1.) Lack of overall demand; the economy is growing slowly. 2.) It hasn't really hit profits. In fact, overall earnings are in good shape. 3.) Small business is still hurting. In reality, I think the primary reason is overall slow demand, with all the other issues a distant second. Both NDD and I are concerned that the new Congress will engage in austerity measures. Both of us feel that this is not the time -- the recovery is simply too fragile to remove government support from the economy. See also this article on the UK situation. And the countries that spent massively are growing at strong rates. So, here is the data. Austerity measures that have been tried and implemented in the current environment have failed. They have led to lower growth and a tremendous amount of pain. Countries that are looking at implementing austerity measures freely admit that these measures -- if implemented -- will lower growth. And the countries that spent massively are growing at strong rates. Let's take a look at the current situation. Total US debt outstanding currently stands at $13.7 trillion while total GDP is $14.7 trillion, meaning the debt/GDP ratio is at 93.19%. Obviously, this is not good, but it is not fatal either. Additionally, the 10-year Treasury is yielding 2.62%, indicating there isn't a risk premium in the US Treasury market regarding our current situation. Even if interest rates spike 200 basis points -- a tremendous amount over a year -- that means interest rates would be 4.62% -- still an incredibly low level. 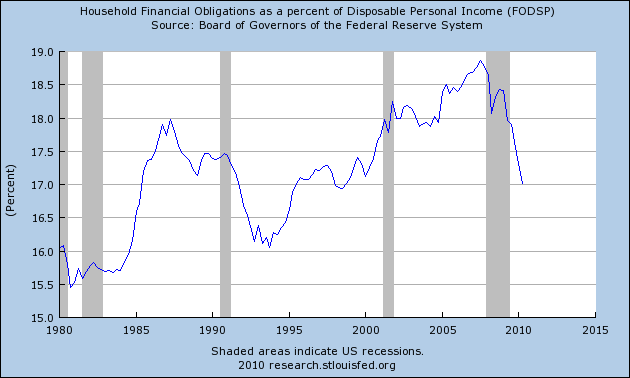 Hell, even a 300 basis point jump to 5.62% would not be as detrimental as some would argue. In other words, we're still pushing the envelope, but we're not going to kill ourselves by spending money right now. And the rewards are tremendous. As I have written about before, the long-term benefits of a solid infrastructure program far outweighs the cost. First, there is the immediate impact of lower unemployment and increase consumer spending. Secondly, the long-term impact is truly amazing, as I explained in this article on my hometown, Houston, Texas. Houston is the fourth largest city in the country, and it would not have gotten to that point without its current infrastructure. You can also read about the economic importance of the US highway system in its forty year report. If you really want to see the benefit do a simply financial projection using the current 10 year interest rate. Make sure you include a monetary value for all the benefits such as land that is now developed that wasn't previously developed, new avenues of trade that have opened up, lower cost of transporting goods because there are fewer traffic jams and wrecks caused by poorly repaired streets, the increase in tax a tax base as new communities develop -- you get the idea. At the macro level, overall growth is incredibly slow -- we're printing GDP growth around 2%. Unemployment is still at 9.6%. Simply put, the economy needs a stimulus right now. $500 - $750 billion of pure infrastructure spending -- that is, spending only on infrastructure -- would help tremendously right now. 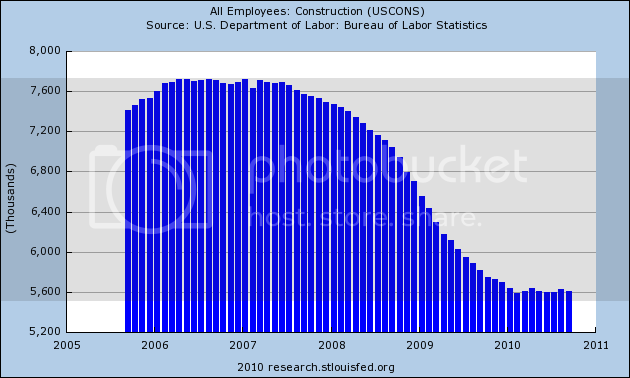 As I've outlined in far more detail before, this would lower construction unemployment (which comprises a large part of the current unemployment picture), fix a national infrastructure that is in terrible repair and provide the economy with a physical backbone that will help it grow in the future. Remember -- the original highway system was built is the 1950s and it is still paying dividends, meaning the benefits have far outweighed the cost. In other words, the data indicates this is not the time to engage in austerity measures. Such measures will hurt an already fragile recovery. As previously indicated, this observation is based on plans that have already been implemented and failed. Those countries considering austerity concede it will hurt overall economic growth. And those countries that spent massively are now growing. 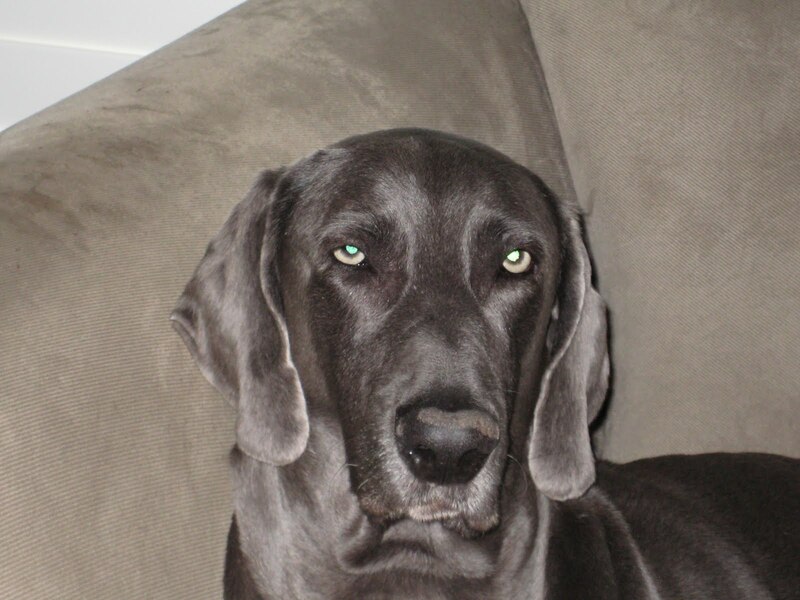 The picture that is available from the available data is clear as a bell. However, it will all probably be ignored. As an initial matter, it gives me great pleasure that, while there are many economic bloggers whose work is picked up in the political blogosphere, we are among the very few writers whose economic writing originated in the political blogosphere, but have been cited approvingly by strictly academic and financial writers such as Barry Ritholtz, Prof. Brad Delong, Prof. James Hamilton, Prof. Mark Thoma, retired Prof. Jeff Miller of A Dash of Insight, and The Reformed Broker. My thanks to all of them for having noticed us. People who fail Barack Obama tend to quietly, quickly, and without drama disappear. The head of the Travel Office, who amazingly thought it would be a good thing to have Air Force One fly low over New York City landmarks was gone shortly thereafter. So was the White House Social Secretary, who allowed gatecrashers to gain entrance to a formal dinner and shake hands with Obama at the White House. With those examples in mind, let me ask you if you think anyone failed Barack Obama in terms of his grand first term strategy? Put another way, do you think Obama was expecting anything like the stinging repudiation of democrats that voters administered on Tuesday? I'd say the answer to those questions are a resounding "Yes" and "No," respectively. Arkansas Congressman Marion Berry [discussed] a meeting he had recently with President Barack Obama. The subject of whether the 2010 midterms were going to be a repeat of 1994 came up. The Arkansas Democrat-Gazette account, quoted in the Politico, said about President Obama's view on 2010 vs. 1994, "The president himself, when that was brought up in one group, said, 'Well, the big difference here and in '94 was you've got me.'" It's safe to say that the humble-pie-eating press conference Obama held yesterday was not what he was anticipating 10 months ago. Back then the narrative was that, faced with accomplishment after accomplishment, Republicans would have no choice but to come to the bargaining table and negotiate with Obama if they hoped to have any influence over the long-term changes in US laws and policies that he had planned. Instead, Obama faces the likelihood of two years of scorched-earth, Clinton-era style personal destruction. It is clear, as any number of others have pointed out almost ceaselessly for the last number of months, that the Obama/Congressional economic policies were too timid. They saved the economy from falling into a second Great Depression, but failed to address stagnant income and persistent near-10% unemployment. Main Street paid them back for that failure on Tuesday the only way they could, by at least temporarily handing the reins back to the GOP. Simply put, the Obama Administration made a monumental strategic miscalculation. And with one exception, the players that brought about that monumental miscalculation have quietly, quickly, and without drama disappeared. Peter Orszag, head of Obama's OMB, resigned in July. Christina Romer, the chair of the Council of Economic Advisers, who infamously predicted that Obama's stimulus would bring the unemployment rate back down under 8% by now, resigned to return to teaching at Berkeley in August. Rahm Emmanuel has decided that running for Mayor of Chicago might be propitious. Even the mighty Larry Summers, Obama's chief economics advisor, a month ago suddenly remembered that he needed to return to Harvard by January if he wanted to keep tenure. In other words, it looks to me like Obama has quietly been cleaning house. So if sometime between now and the end of the year Timothy Geithner should decide that it would be a rational economic move to return to his unsold house in Westchester County, New York, don't be surprised. That will be the most clear sign that Obama, finally, with his thoughts firmly centered on not having to make a concession speech two years from now, "gets it." As to the economy, where do we go from here? Since no further fiscal stimulus will be forthcoming, the choices are (1) do nothing and hope the economy can slowly recover on its own, or (2) go off on a right-wing tax-cuts-for-billionaires,-austerity-for-the-masses bender, with disastrous consequences. I happen to believe that (1) might -- much more slowly, painfully, and inefficiently than necessary -- work. I hate to say it, but unfortunately I think Washington is going to decide on (2). The Obama Administration will probably continue to eschew confrontation and seeks accomodation at every turn. Either way, the opportunity to address the yawning chasm of maldistribution of income and wealth - that has been translated into an equally yawning chasm of power in Washington - has been lost again. 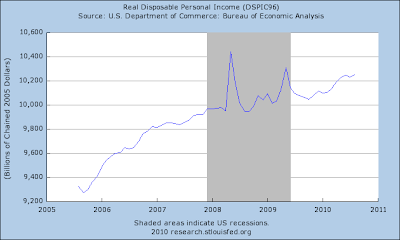 Regardless of whether the economy continues to recover, or whether asinine kleptocratic policies drive the economy back into a serious double dip recession, it appears that for years to come, 2000 will stand as the high water mark for real personal income to the average American. 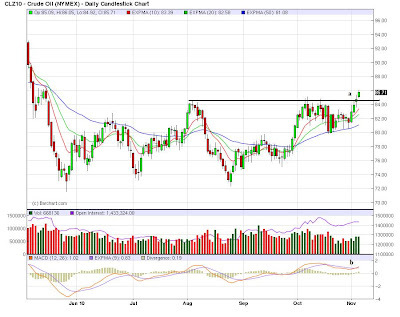 The big news yesterday was the dollar, which moved though several key support areas on high volume. 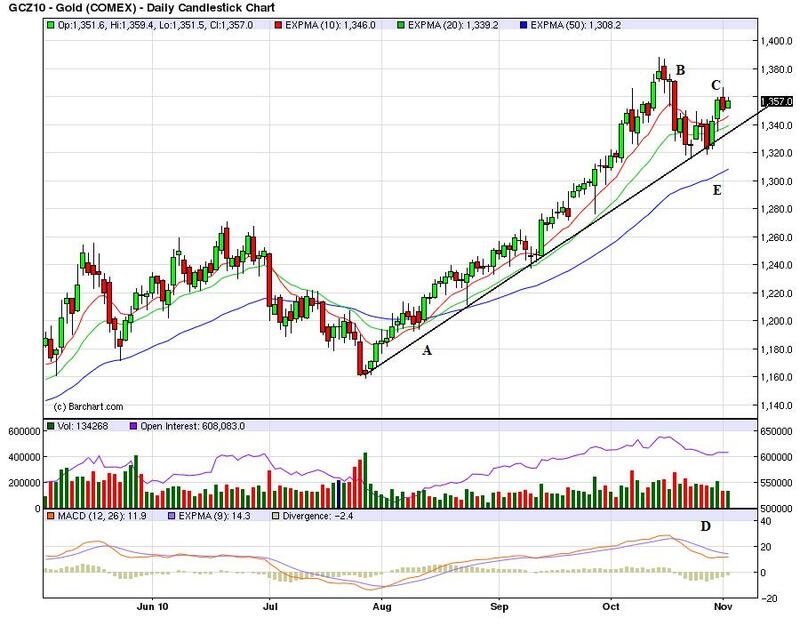 Over the last few weeks, I've commented that the dollar was forming a selling climax, largely based on the prices bunching at a low area and converging around the EMAs. The Fed's move into QEII is a strong fundamental development that will provide strong, downward momentum for the dollar going forward. Stock prices opened slightly higher (a) and moved sideways for the first hour of trading, after which prices moved through key EMAs (b) and settled near the 200 day EMA until the Fed's announcement. Notice that the period right after the Fed announcement was extremely volatile (d), with prices moving strongly accompanied by higher volume. However, prices finally made two pushes higher at the end of the day (e and f). Notice that stock prices moved through key resistance levels yesterday. Treasury prices gapped higher at the open (a) and traded sideways until the Fed announcement (b). 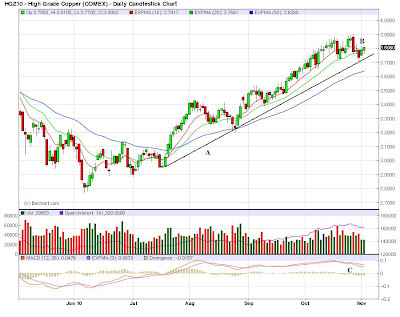 Prices dropped hard at first (c), but they found support at key levels (d) before rebounding at the end of trading (e). Treasury prices retreated to just below the 50 day EMA (a), but have since rebounded to the 10 day EMA level. While the short term trend is moving lower (the 10 and 20 day EMA), notice the 50 day EMA is still positive, indicating the long-term trend is still positive. 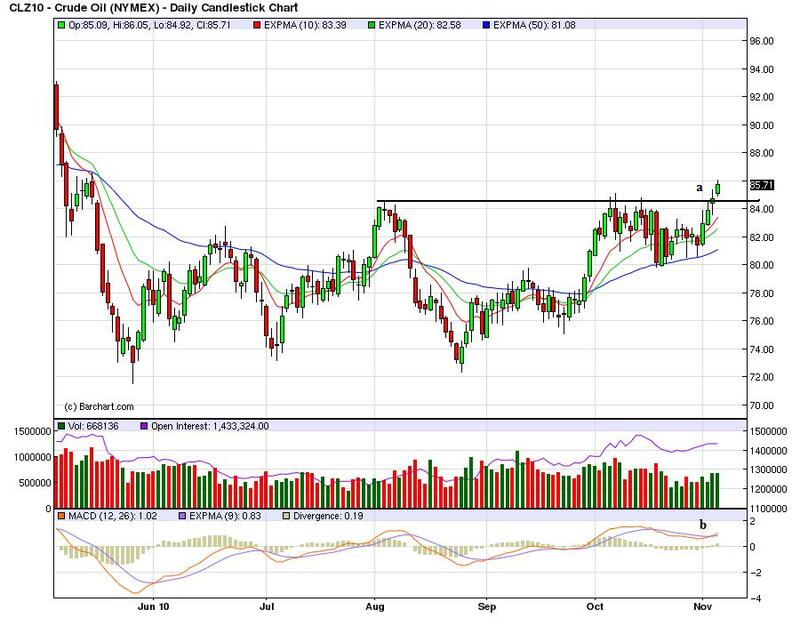 Crude oil finally moved through key resistance (a) and printed a buy signal on the MACD (b). Also notice the EMAs are still positive with all moving higher and the shorter above the longer. Today we have been linked to by several prominent financial and economic blogs. The Reformed Broker was kind enough to label us a Jedi Master. Considering my love of the Star Wars franchise, I was especially pleased by this designation. Financial Armageddon also reprinted this list. In addition, Professor Mark Thoma was also kind enough to place us in a recent link fest. And as an added bonus, we've just received a mention in the NY Times Economix Blog. If you are here because of those links, welcome. We hope you come back. 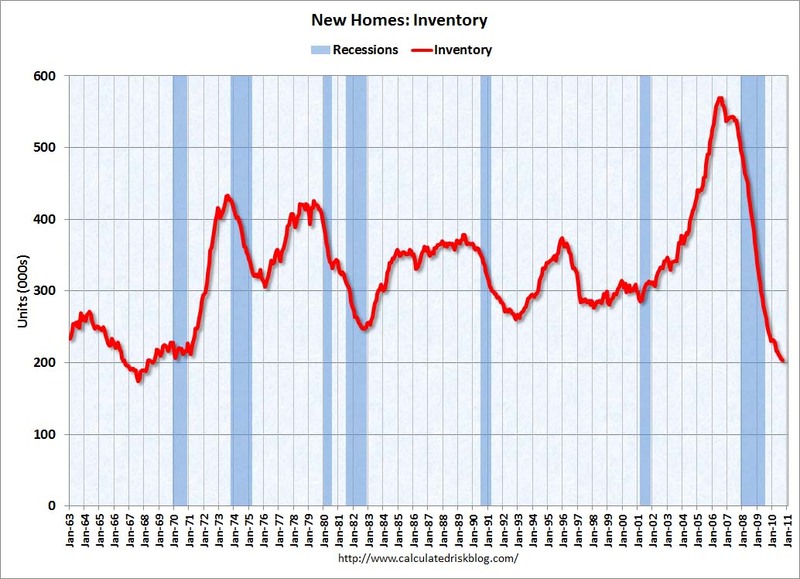 The total inventory of new homes for sale is at the lowest level in a generation. This means that a marked increase in demand for new homes would lead to a big increase in new home construction, which would be a tremendous boost to the economy. This would increase construction employment -- a truly terrible part of the job market right now -- and also increase durable goods purchases (appliances and furniture). In short, a big increase in new home construction would be a big help to the economy. And -- the elements of a surge in new homes sales are in place. Housing affordability is at incredible levels right now as well -- meaning this is really a great time to buy a home. Consumers are also in better shape to purchase a home. Consumers have been saving more money so they can put more money down. In short, the new home sales market is ready for a sharp turnaround. The real question is what would spark that move in the economy? The answer -- as with consumer spending -- is jobs. Consumers need a sign from the economy that the worst is over. And the best sign of that would be 3-5 months of strong job gains. Until we get that, we're treading water. I rarely write about politics, but given last nights events, it seems appropriate to make a few comments. Personally, I have moved from liberal in college to libertarian when I was a bond trader to conservative Democrat to my current position of independent. I'm an independent for the following reasons: the Democrats can't lead at all -- they want everybody to get along -- and don't want to hear basic economic information when it runs counter to their narrative, the Republicans have walked away from logic and fact and the Tea Party could care less about mere competence. As such, all parties have key flaws making them unable to effectively govern. Hence, you get our current mess. Do I think anything will change? Yes -- for the worse. The economic recovery is fragile and still needs support. It will not get it. Within the first year, the House will either argue about what spending to cut and implement same or will wind up shutting the government down for a short or extended period of time (completely forgetting the GDP equation). 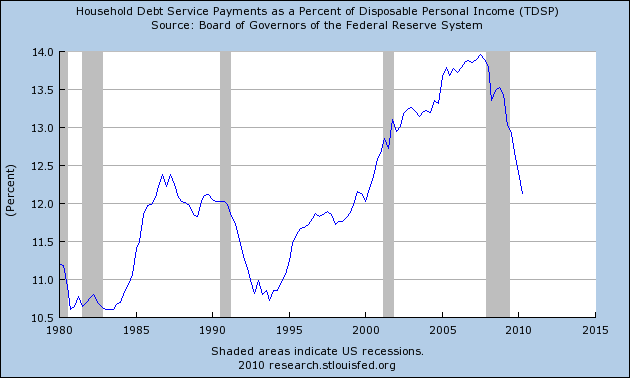 This will seriously threaten if not jeopardize the recovery. The Senate will cower in fear and accomplish nothing (which is to be expected from an institution populated by really old white guys) and the President will be ineffective (thinking that selling anything is below him)-- at best. As I have repeatedly said there is a time and place to cut spending. This is not the time. What the country needs is the following: once the recovery is cemented, taxes have to increase and spending has to decrease. The problem with the first is Republicans are married to the "tax cuts always pay for themselves" line of nonsense (the stupidity of which Barry Ritholtz clearly explained and refuted in this post) and the Democrats are completely unwilling to look at entitlement reform -- spending which now accounts for about 60% of federal expenditures and which has been increasing for the last 30 years. 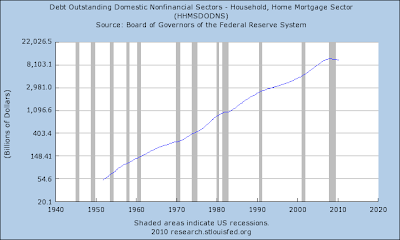 The input/output gap at the federal level is simply too wide to be solved by any other option. Yet neither party wants to compromise on their core issues. As such, the impending train wreck continues to approach. So, I think the election means we're not going to solve anything and the fundamental problems will get worse. The DIAs are near their yearly highs, and simply need a push to continue their upward trajectory. The IWMs -- while below key yearly levels - are just below key resistance levels as well. The Transports are also making new yearly highs. The point of the above four graphs is to demonstrate the market breadth is hitting across all markets, not just the SPYs. In other words, the rally is part of all markets. Also note that all the above markets are at or near key levels, indicating they are waiting for the Fed's decision tomorrow. The long end of the curve has led the way lower. Prices have broken a clear uptrend and are moving lower in a disciplined downward sloping pennant pattern (a). Also note that money is leaving the market (c and d) and momentum is clearly negative (e). Now the mid part of the curve is starting to sell off a bit. Prices have broken a long-term uptrend (a), money is leaving the market (b and c) and the MACD is moving lower (d). Raw sugar may climb 19 percent by March if dry weather in Brazil, the world’s biggest producer, persists, amid growing demand from countries including China, according to broker Newedge USA. The price may reach as high as 35 cents a pound, Michael McDougall, a senior vice president at Newedge, said in a phone interview from New York yesterday. 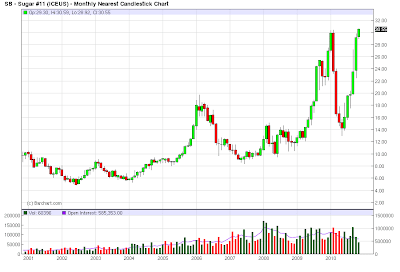 A rally to that level will make the commodity the most expensive since November 1980. Raw sugar in New York has more than doubled since reaching a 13-month low on May 7 on concern adverse weather will reduce output in Brazil, Russia, China and Pakistan. The market needs supplies from India, the second-biggest producer, to meet a deficit, McDougall said. “If there’s less rain than normal in Brazil until March you could potentially see a reduction in the cane harvest and then you have a potentially big problem,” he said. McDougall in August correctly forecast that sugar will exceed 23 cents. Futures rose for a fourth straight session yesterday amid speculation that India may curb exports as it builds stockpiles. Raw sugar for March delivery climbed 1.1 percent to settle at 29.45 cents ICE Futures U.S.
“Current prices show that the market needs Indian sugar,” McDougall said. Last week I discussed Withholding Tax receipts at length, noting that the professional service which uses them to estimate job growth has had a much better record reporting gains and losses in the job market during the Great Recession than the BLS's initial nonfarm payroll figures. I said I'd update when they reported on October. Well, they have. Earlier this morning TrimTabs' spokesperson, Madeline Schnapp, said their figures show that 100,000 private sector jobs were added to payrolls during the month of October. Please note that this isn't a prediction of what the BLS will say on Friday. It is its own independent estimate, and if anything is a prediction of what the BLS's ultimate report will say in a year and a half when the final 2010 revisions are done. More On Friedman/Japan, by Paul Krugman: ...So: David Wessel quoted what Milton Friedman said about Japan in 1998, and interpreted it as meaning that Friedman would favor quantitative easing now. I think that’s right. And just to be clear, I also favor QE — largely because it might help some, and seems to be just about the only policy lever still available in the face of political reality. So, after 2000 the Bank of Japan engineered a huge increase in the monetary base; this was the original quantitative easing. And it didn’t even translate into a surge in the money supply! This is why I’m so skeptical of people who say that all the Fed has to do is target higher nominal GDP growth — in liquidity trap conditions, the Fed doesn’t even control money, so how can you blithely assume that it controls GDP? And this also calls very much into question Friedman’s famous claim that the Fed could easily have prevented the Depression, which gradually got transmuted into the claim that the Fed caused the Depression. Yes, M2 fell — but why should we believe that the Fed had any more control over M2 in the 30s than the BOJ had over M2 more recently? Again, that doesn’t mean that I oppose having the Fed engage in unconventional asset purchases. I’m just trying to be realistic about the likely results. 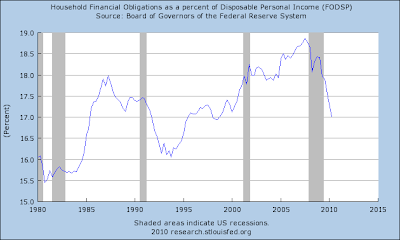 We really, really need expansionary fiscal policy along with Fed policy; and we’re not going to get it. I have no problem with the policy idea or implementation. The bottom line is the economy needs some type of jump start. However, I don't think this will be a huge success, largely because people are de-leveraging right now and business can get a great deal from financing their debt on the open market. The manufacturing sector grew during October, with both new orders and production making significant gains. Since hitting a peak in April, the trend for manufacturing has been toward slower growth. However, this month's report signals a continuation of the recovery that began 15 months ago, and its strength raises expectations for growth in the balance of the quarter. Survey respondents note the recovery in autos, computers and exports as key drivers of this growth. 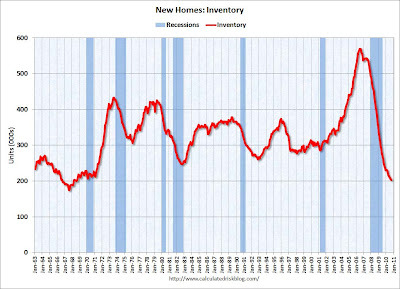 Concerns about inventory growth are lessened by the improvement in new orders during October. With 14 of 18 industries reporting growth in October, manufacturing continues to outperform the other sectors of the economy." As I noted when I looked at the Beige Book's manufacturing numbers, the auto industry is making a comeback. Let's take a look at some of the other parts of the report. Of the 18 manufacturing industries, 14 are reporting growth in October, in the following order: Apparel, Leather & Allied Products; Primary Metals; Petroleum & Coal Products; Machinery; Electrical Equipment, Appliances & Components; Miscellaneous Manufacturing; Fabricated Metal Products; Paper Products; Printing & Related Support Activities; Transportation Equipment; Computer & Electronic Products; Food, Beverage & Tobacco Products; Plastics & Rubber Products; and Chemical Products. The two industries reporting contraction in October are: Nonmetallic Mineral Products; and Furniture & Related Products. 14 of 18 industries are showing growth. That's a good number and indicates more strength than thought. First, several comments note the lower dollar is having a negative impact on commodities -- which is pretty obvious but important to keep in mind. Again, there is a mention of the auto sector making a contribution. Finally, it appears there still isn't alot of confidence in the overall environment, as people are making orders at the last minute. ISM's New Orders Index registered 58.9 percent in October, which is an increase of 7.8 percentage points when compared to the 51.1 percent reported in September. This is the 16th consecutive month of growth in the New Orders Index and the largest month-over-month improvement since January 2009. A New Orders Index above 50.2 percent, over time, is generally consistent with an increase in the Census Bureau's series on manufacturing orders (in constant 2000 dollars). ISM's Production Index registered 62.7 percent in October, which is an increase of 6.2 percentage points from the September reading of 56.5 percent. This is the largest month-over-month improvement since January 2010. An index above 51 percent, over time, is generally consistent with an increase in the Federal Reserve Board's Industrial Production figures. This is the 17th consecutive month the Production Index has registered above 50 percent. Both of these numbers are good news for the economy. First, new orders increased sharply, indicating the lull over the summer may be over. In addition, production increased, which is also obviously a good sign. Overall, this is a very encouraging report. Equity prices opened higher (a), rallied (b) but couldn't hold momentum, so they fell to just below the open and consolidated (c). Prices fell through support (d), consolidated into the EMA (e) and moved lower still (f) before rebounding at the end of trading (g). Notice how the arc of prices is stalling (a). Treasury prices dropped hard after the open (a), but consolidated their losses for the remainder of the day. Copper is still in an uptrend (A). However, we've seen prices dip to the trend line over the last week or so and the 10 day EMA is starting to move lower (B). Also note that momentum is decreasing (C). This could be a simple correction -- and, as long as prices remain above the EMA, that is the correct interpretation. However, a move below the trend line would signal a change worth noting. 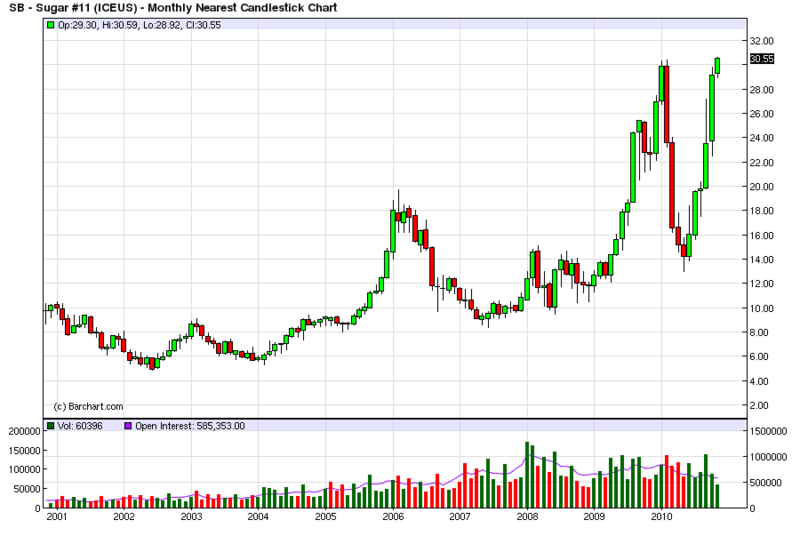 Gold prices are still in an uptrend as well (A). Recently prices have spiked above the trend (B) fallen back and moved a bit higher (C). However, momentum has clearly decreased (D). As with copper, it's important to keep an eye on the price/trend line relationship. Cooking oils, left behind in this year’s surge in agriculture prices, are poised to catch up with grains as record demand cuts stockpiles by the most in 17 years. Inventories of soybean oil and palm oil, used by Nestle SA and Unilever and in everything from Hellmann’s mayonnaise to Snickers candy bars, will drop 12 percent in the coming year as China and India increase consumption 11 percent, U.S. Department of Agriculture data show. Food prices climbed in September to the highest level since the crisis in 2008 that sparked riots from Haiti to Egypt, the United Nations says. Increasing wealth in Brazil, India and China is boosting demand for grains, dairy, meat and cooking oils. While Sime Darby Bhd., the world’s biggest listed palm-oil producer, is benefiting from rising prices, governments from Beijing to New Delhi are trying to curb food inflation by raising imports, limiting exports or selling stockpiles. Per-capita use of vegetable oils in China has more than doubled in a decade, said Bill Nelson, a senior economist at Doane Advisory Services Co., an agricultural research and advisory company in St. Louis. Last week, I noted there are several possible scenarios that could lead to further, or increased growth in the economy. Over the next week, I'm going to develop these ideas in more detail. 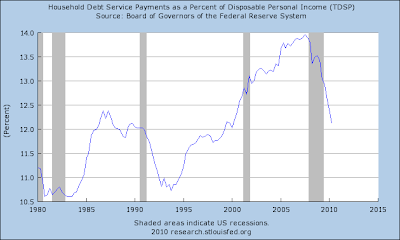 The first of these areas is consumer spending. As I noted in last week's GDP report, PCEs have been increasing in the 1.5% - 2.6% range for the last five quarters. 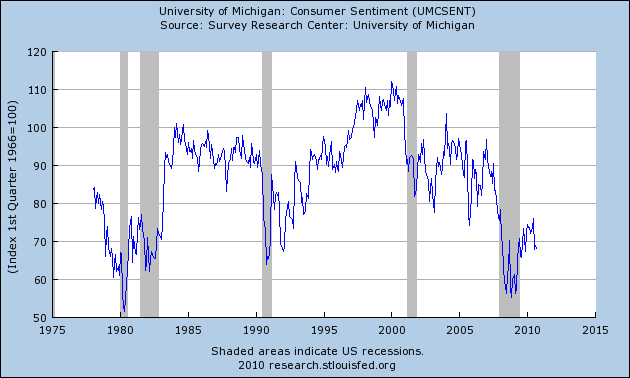 While this indicates consumers have been buying more and more goods and services, this pace is below that of previous expansions. This leads to the question, what is holding consumers back from increasing their buying? 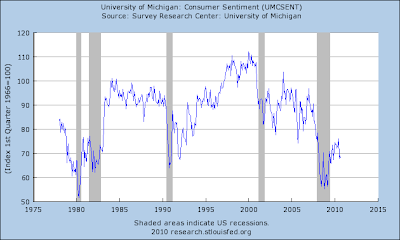 Lower sentiment means depressed consumer activity. As such, the lower PCEs should not be considered abnormal. Lower DPI growth also leads to lower PCEs. 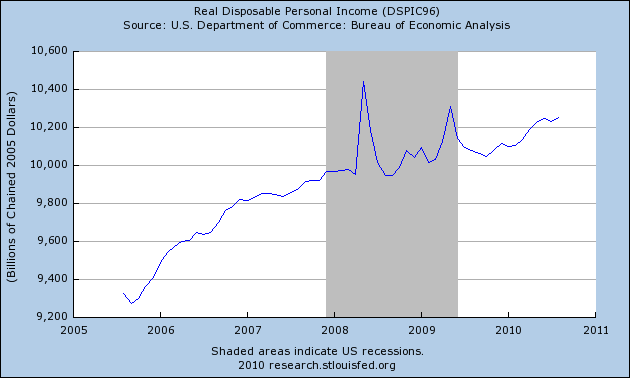 So, we have a depressed consumer who's real pay is not growing. 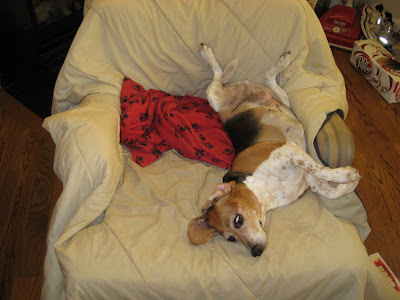 As such, he's been spending but is very price sensitive and is always looking for deals. The decreasing financial obligations ratio indicates consumers will be able to borrow more if they have a reason. I believe that reason is an improved jobs markets -- one where the consumer sees the possibility of real and sustained job gains. That means we need to see at least 3-5 months of meaningful job growth -- say, in the 150,000-200,000 month range. While the election results from tomorrow will wind up having a great impact on the economy in the next two years (so please make sure you vote! ), economic news this week will be dominated by the jobs report on Friday. Real GDP is up about 3.1%. Since you don't get job creation unless GDP is up over 2%, in the graph above 2% is subtracted from YoY GDP growth. GDP leads jobs, and real retail sales leads both. For the last 6 months, real retail sales have been up an average of about 4%. That should eventually result in 2% job growth, or 2,5000,000 jobs. Even if stimulus money has created jobs in Asia in response to retail spending here, nonetheless real GDP growth suggests eventual job growth of about 1,500,000 YoY. 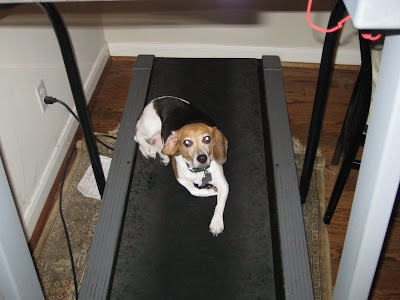 The questions are, how fast and how soon? The two most important sectors to watch on Friday are the two for which stimulus lapsed: construction and state/local government. As I have pointed out a number of times, this "reset the clock" back one year in both areas. Normally, construction jobs would have been growing for almost a year, and state/local layoffs, which depend on tax returns and thus lag about a year, would be tailing off. Not so this time. This leveled off at the beginning of this year. On Friday a positive number would be as good as can be hoped for, and at very least a loss of less than 20,000, which keeps this series in its range for the year, would at least mean that the bottoming out process is intact. While I can't show you a nice graph of government jobs, because of the Census distortion, it is clear that we are going to continue to lose jobs here. Last month we lost 47,000. Some of that was probably seasonal due to the school year vs. education layoffs. We probably won't see a positive number here, but a substantial decline in jobs lost compared with last month would be a start. P.S. 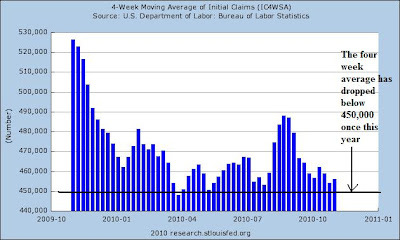 : Last week I highlighted TrimTabs' use of daily tax withholding receipts to estimate job gains or losses. So far, they have not made any public statements about October's jobs number.